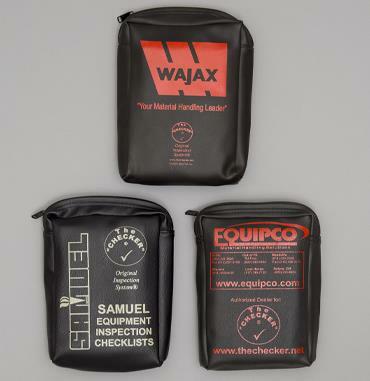 Our weather-resistant storage pouches are designed specifically for The Checklist Books. They are perfectly sized, sturdy, and mountable in vehicles or on walls, I-beams, etc. for convenient access. As with the books themselves, they can be personalized with your logo. Each storage pouch includes 2 Velcro-style, hook-and-loop, heavy-duty mounting strips (except the MINI-POUCH storage, which comes with 1 strip). The Small Storage Pouch is a weatherproof, zippered holder, protects and holds 1 or 2 hand-sized Checker books. 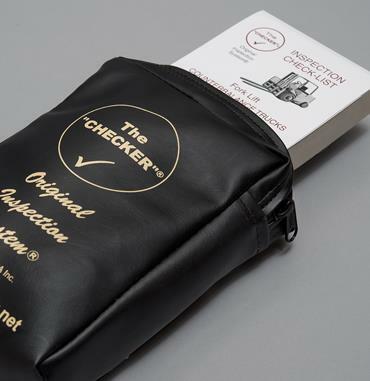 The Small Storage Pouch features extra weatherproofing with a Waterproof Zipper, protects & holds 1 or 2 hand-sized Checker books. The Large Storage Pouch is a weatherproof, zippered holder, protects & holds either 1 large 8½" x 11" Checker book or our 4½” x 7” hand-sized books. Can also hold Operating Manual etc with opening approx. 1¾" to 2" thickness. The Large Storage Pouch is a weatherproof, zippered holder, protects & holds either 1 large 8½" x 11" Checker book or our 4½” x 7” hand-sized books. Can also hold Operating Manual etc with opening approximately 1¾" to 2" thickness. The MINI-POUCH isn’t for books, but it’s perfect for storage of smaller items such as wallets, receipts, cash, change, documents, small tools, etc. Get the very latest from our blog emailed directly to you as soon as it is published. Never miss any of our brilliant and insightful posts. The Checker’s equipment-specific detail will let employees know you truly value inspections, helping you to build a culture of respecting equipment. 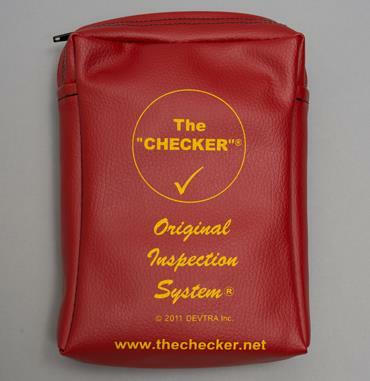 The Checker is the best equipment inspection solution you’ll find, whether you want to use paper books, digital tools, or both.